First let us understand what is EdgeRank in simple terms..
It’s an algorithm that Facebook uses to determine what content should be displayed on your news feed. With this algorithm, user gets the content and feed only which he prefers or likes! All the feed for which the user has a low interaction rate would often disappear or appear at a moderate rate of occurrence. This controversial algorithm was explained by Will Cathcart in a press conference last year. In September 2012, Facebook did a major tweak in the feed Algorithm, after which, some companies complained about limiting reach to the users, while others benefited from it. A person is likely to get news feed of Game X more often than Game Y, if he had clicked/played game X in the past on Facebook. He would be notified of upgrades and achievements of his friends in game X more than from game Y.
Logically so, game X is more relevant to the user, thus Facebook does not choke down the news feed with all kinds of games/videos and links that the user does not want! But is the algorithm really always helpful? Let’s dig further in the EdgeRank algorithm using two different user interactions on Facebook. a. Your previous interactions: All your activities are tracked down so that the more you engage with a friend – viz. likes and comments and shares, the more you would see the same friend’s posts in the newsfeed. b. Your Interaction with a certain type of posts: If you have a hobby and you are keenly interested in the subject. Like cooking or football or pets or astrology, it’s more likely that you would see the newsfeed related somewhat similar to your hobbies or interests. a. Reactions from those who already “Saw” the post: Suppose you have a community page of good friends. And one of them uploads two photos from his picnic to some place. One of the posts get more likes and comments (probably is more interesting than the other), while the other is idle without any significant number of likes. The algorithm would then adjust your newsfeed such that you are likely to see the post of photo with more likes on your feed. b. Negative comments or bad remarks: It is less likely that you would see a post pop up in your newsfeed if it already has negative comments or abuses to that post. 96% of Facebook fans never go back to the brand page after initial engagement. 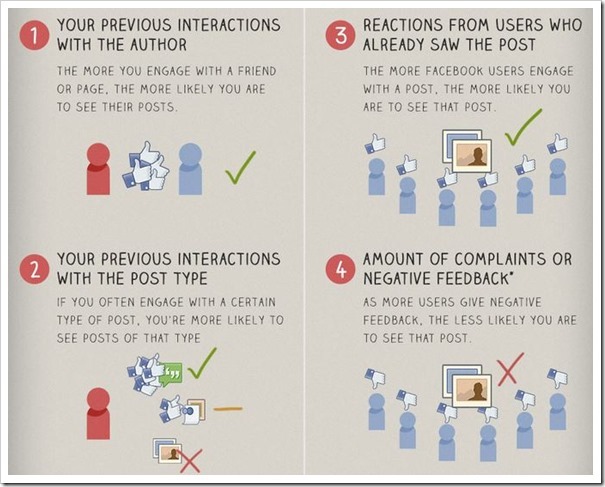 Thus, your post is 40-150 times more likely to reach the subscribers than just the page. Using the below methods, commercial brands and startups can popularize the material with ease. If you are into publishing brand value and recognition on Facebook, here are some tricks that might just get you ahead of your peers. Brands should keep it short. Posts with 100-250 characters get 60% more likes than lengthy stories about brands. Uploading visual articles, like photo albums and videos get more than 100% attention as compared to a post with plain text, from the audience generally. Having polls and opinions of users only helps increasing brand value. Also, what better way of having a customer feedback than this! Posting timely and daily (if the brand needs it) is an added advantage. As it’s less likely that a user would check the brand page again, it’s always advantageous to post more often and post quality material – not just a brand blabber. Keeping it simple and short, and updating it timely with quality- seems to be the mantra of brand management on Facebook. Apart from being a Engineer at a leading IT firm, I enjoy playing guitars, reading books, updating technical knowledge and listening to music. Avid classic rock music enthusiast and sports lover. Myntra Launches Seamless Product Exchange Service for Online Shoppers! Twitter as Curation Tool? Yes, Its Now Possible With New Custom Timelines! What’s your Social Media Strategy in 2013?